Whole Foods, also known as “Whole Paycheck,” and Monsanto (yes, the company that has patented plants) have partnered up in order to keep you in the dark about GMOs. Wow. Whole Foods and Monsanto. I never would have seen that one coming. Its not just Whole Foods, either. 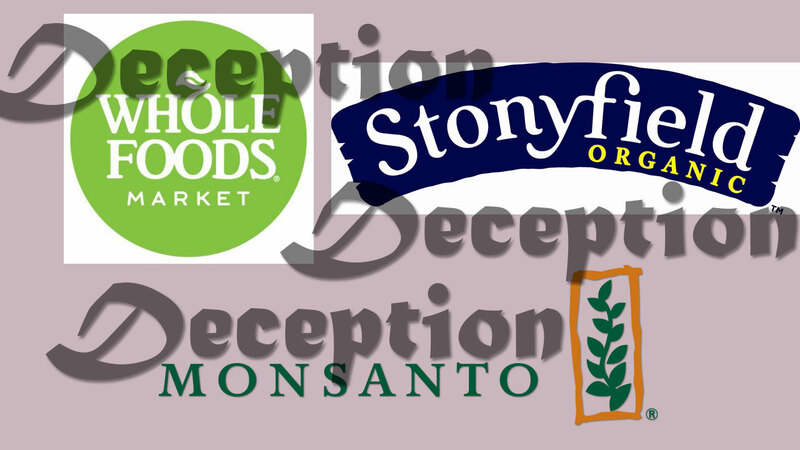 It’s other brands that promote themselves as being pro-organic like Stonyfield, Organic Valley, etc. They have helped create a new “GMO labeling compromise” in the U.S. Senate that isn’t a compromise, at all. The proposed “compromise” says that there is no requirement for the labeling of GMOs. That’s a compromise? That sounds very one-sided, to me. And why would Whole Foods not want GMO labeling, anyway? Well, they have many products in their stores that have GMOs constructed by Monsanto, and if people saw that they had GMOs in their stores, they’d lose a lot of business. Well, I think this might make them lose even more business. They have sold out, and are paying people off, in order to make more profits, while threatening the health of their customers, and the children of the parents shopping at Whole Foods, thinking they’re a reliable company. I am literally in shock. I can’t believe a company like Whole Foods would even consider doing this. Their customers have faith in them to give them the best quality foods. I guess they’re fine with deceiving they’re customers, and jeopardizing their health, in order to have more profits. I don’t know about you, but I feel deceived. I buy food from Whole Foods because I thought it was better than giving the money to “big corporations.” Well, I guess Whole Foods is now on the list of companies not to buy from. They have completely lost my trust. I am now wondering if their food called organic is even really organic. It probably is, but that’s how much they have lost me. I have a feeling they may lose a lot of workers, as well. People work at Whole Foods because of what it is. Once they find this out, they’re not going to want to work for them. They’ll feel like they are supporting the enemy. I know I would. If you DON’T WANT WHOLE FOODS AND MONSANTO TO GET THEIR WAY, click here for the Food Democracy Now page to take action now. Previous Post Vitamin B-12: I’m Deficient, and So Are YOU!